Ghost Rider Teased For Agents of SHIELD Season Four? 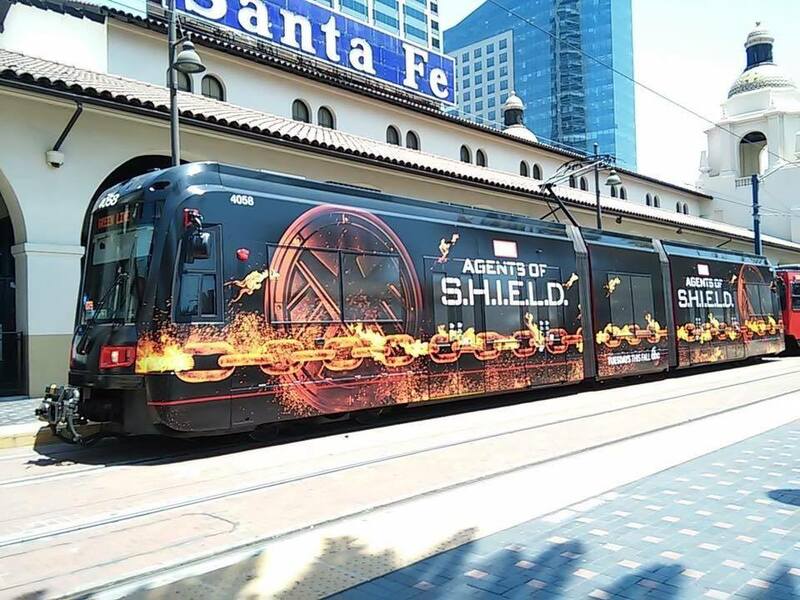 ABC and Marvel Entertainment have released an interesting tease of what’s to come when Marvel’s Agents of SHIELD returns this fall. 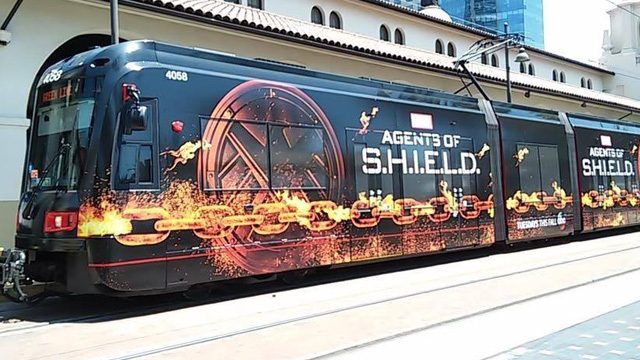 As you can see in the above image (check out a larger version in the gallery below), a San Diego trolley has been decked out with one Hell of a teaser image. Could Ghost Rider be making an upcoming appearance? Of course, a flaming chain doesn’t necessarily mean Ghost Rider, as a Hellfire chain was the weapon of choice for the Secret Warriors‘ character J.T. James, aka Hellfire. James made his television debut, played by Axle Whitehead, on the series last year. With the Ghost Rider rights back at Marvel, it’s possible that we could see the motorcycle-riding antihero rear his flaming head, however, as Ghost Rider and Hellfire share a bit of a history. Before Marvel Comics even existed, the western hero known as Ghost Rider made his debut in 1949’s “Tim Holt #11.” By 1967, the Ghost Rider copyright had lapsed and Marvel Comics began publishing their own version of the cowboy hero. Batting evil on horseback, Carter Slade dressed in a phosphorescent white outfit to take on evildoers. Five years later, Marvel Comics introduced the Johnny Blaze version of Ghost Rider, a contemporary supernatural antihero who, after making a deal with the devil, battles evil atop a motorcyle. With the success of the Blaze Ghost Rider, Slade became retroactively known as the Phantom Rider. In the comics, J.T. James is the grandson of Phantom Rider Carter Slade and, from him, inherited the Hellfire chain. Although no such history has, as of yet, been made a part of Whitehead’s take on James, it’s looking pretty likely that we’re going to learn a whole lot more about James’ history in season four. The Slade character made an appearance in 2007’s Ghost Rider film, played by Sam Elliot. Do you think Ghost Rider will appear on Agents of SHIELD season four? Let us know your thoughts in the comments below!